So I have broken my fabric diet in a sort of big way. I haven't bought any fabric at all this year, in fact the last I can remember purchashing some was last October although I have a tendency to push it to the back of my mind so who knows..... Anyway, I say 'sort of' big way because the amount purchased was a lot, but only a little bit is stash bound so it's not so bad really! The triangle windows above are still unpainted and unwashed at this stage, and coming up with a curtain solution for them has me stumped. I think I will leave them unclothed because they don't really contribute to the glare I was experiencing sitting on the lounge but they still let lots of light pour in. Anyway these curtains are only stage one for this room, for winter I plan to make some heavy drapes to go over the top for warmth and energy efficiency reasons but for now this is all that is needed in this room. thank you all for your advice re Anna's poo habits - she seems to have settled into a routine now of only going every few days which according to you all is normal. I guess it's a good thing because it means less really messy nappies to clean up, especially as now I have a laundry again I'm going to start using cloth nappies which was my intention from the start. While Anna is still relatively small I'm going to use terry towelling flats since I have a stack of them thanks to the lovely Raewyn who gave me a heap last year and they are a better fit on little bot bots. Ok, sewing your own menstrual pads may be much weirder, which plenty of people do I have discovered while researching nappies! Anyway I'm not going down that path, but I have made a pocket nappy, made from the Wee Weka pattern, and it's designed to convince lazy and recalcitrant husbands that using cloth nappies is no harder than using disposables! It's made from a PUL outer layer, which is some fancy schmancy waterproof but breathable laminated fabric, with a lovely soft microfleece inner against the skin, and in between those two layers (ie in the pocket) I've got some bamboo fleece which is ultra absorbent. It was pretty simple to make, thanks to the wonders of fold over elastic, but a bit fiddly. Given the cost of the fabrics and the time to make it I can see why these are selling for $20 - $30 a pop, although I would never pay that because I'm extremely thrifty (*cough* cheap). For anyone else who may be interested, I got my fabrics online from Green Beans which is a New Zealand company but have such good prices that even with postage it was the best value I could find, plus they posted really quickly. There's also a comparison of the three most popular free nappy patterns here, which helped me decide which to use. So this week I had what could almost be called a social life! I went out to a restaurant with my parents and Anna slept most of the time in her pram until the end when she sat quietly in my lap, much to the visible relief of the other diners (it was a small restaurant). Then on Wednesday I watched a movie with my mothers club group in a cinema that has one of those crying rooms but none of the babies cried the whole time anyway! And then yesterday I met up with some friends for a walk in the park and yum cha for lunch, and since Anna was being so good I even took a walk around Ikea. That place is baby central during the weekdays, of which I am now one of those ladies of leisure with nothing better to do than shop during the day (ha ha just kidding, I wish!). Oh and a big congratulations to Carolyn over at diaryofasewingfanatic who welcomed a second grandson into the world this week! Also congratulations to my friend Jenny who just found out she is going to be a grandma for the second time, which is fantastic news since her daughter had a cervical cancer scare recently but thankfully was ok - go have pap smears ladies, it may save your life. In the end, I even had to reduce the new born size a fair bit, tracing off the Target pants to get ones that will actually fit her now, not in years to come..... What I'm extremely embarrassed about though is that I made these pants and top for a friend last year for her baby and if she tried them on her little girl they would be way too big and they must think I'm bonkers or have no idea about babies (which would be right actually!). All that's left to do is put the skirting boards down, paint them and the architraves around the window and get busy decorating with some light fittings, furniture, artwork etc. We're still undecided about the staircase, we may change it for a more modern design but for now it will stay as is. Outside though is still a complete disaster zone though, with the builder still to remove some rubbish and then some earthworks to be done before we can turf and landscape. But thankfully the builder wil soon be finished his work and will go away, because frankly I never want to see or hear him and his dopey offsiders ever again, they've been hanging around for far too long already. Of course we still have a mile long list of things to finish off, like painting the outside of the house and garage (eek! ), some additional cabinets and new benchtop for our enlarged kitchen, and some more painting in the rest of the house as well as fitting out my sewing studio (which incidentally is at the top of the list!). Ok enough harping on by me about how none of my clothes fit my post baby body, I figured there were two things I could do about it: either lose the weight or sew some new clothes. Given that I have the means and materials (many, many materials) to sew some new clothes I took the easy option and made some new pants. I don't often make pants because I'm really bad at it. Well I suppose I'm good at sewing pants, I'm just bad at making pants that fit me! Since I'm a pear shape with quite a large difference between my hip and waist measurements with some saddlebags thrown in for good measure, getting pants that skim over my hips but fit around the waist with any gaposis is actually difficult. But I have found that Vogue 2907, an Alice + Oliver pattern is actually quite good for my body shape because they are hipsters and they have a centre back seam which allows for adjustment. Although I did make some adjustments to them because they are obscenely low waisted, so I raised the centre back by 5cm, grading down to 2cm at the sides and then blending down to the original waistline at the front. I also put two darts in the back and pinched the centre back seam of the waistband in at the top to get a nice snug fit around my waist and prevent the old 'plumbers crack' whenever I bend over or sit down! I also think that the fly zipper method used by this pattern is way too fiddly - it requires cutting out a seperate tab piece for the fly cover and sewing it on, instead of just cutting it out from the fabric and folding it back. Thank god for Sandra Betzina's video tutorial over on the Threads website about how to do a foolproof fly zipper which is the easiest way I've found to do a zipper and it always come out perfectly following her directions. 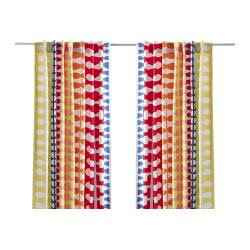 Jean - in answer to your question in the comments to my last post about the curtains in Anna's room, they are these ones from Ikea. They are a bit Orla Kiely inspired (ripped off?) and similar to the lovely fabric Erin used for her mini duro dress but a bit more bright and on a larger scale. This isn't as bad as it looks, trust me! I haven't completely overtaken my daughter's bedroom just to set up my sewing machines, she has been sleeping in a bassinet beside my bed while we temporarily used her room firstly for the inlaws to sleep in when they were here and then for general storage when our third bedroom (which was being used for storage) had the wall linings replaced. Believe it or not this is the only table in the entire house at the moment, the dining table and all other desks are packed up in storage, but it has turned out to be a good spot to sew because I pop Anna in her cot during the day when she's awake and she generally falls asleep to the sound of my sewing machine. Hopefully this early exposure will mean she will become a world famous fashion designer with loads of lovely fabric for me to play with! Of course the fashion game will be in between her making oodles of money playing professional golf but only when she's not carrying out brain surgery LOL! The inside has been painted, but we are waiting for some faults in the concrete slab surface to be rectified before we can get the timber floors laid. There is some major rubbish removal to happen in the back yard but thankfully that is the job of the builder.